For the ABC TV series, see Landline (TV series). For the superseded Ordnance Survey data product, see Land-Line. For the novel, see Landline (novel). For the upcoming film, see Landline (film). 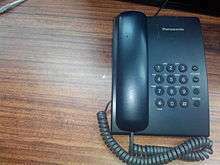 A landline telephone (also known as land line, land-line, main line, home phone, landline, fixed-line, and wireline) refers to a phone that uses a metal wire or fibre optic telephone line for transmission as distinguished from a mobile cellular line, which uses radio waves for transmission. In 2003, the CIA reported approximately 1.263 billion main telephone lines worldwide. China had more than any other country at 350 million and the United States was second with 268 million. The United Kingdom has 23.7 million residential fixed homephones. 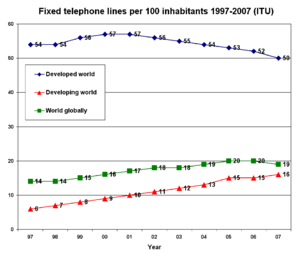 The 2013 statistics show that the total number of fixed-telephone subscribers in the world was about 1.16 billion. The number of landline subscribers continuously decreases due to upgrades in digital technology and the conveniences that come with switching to wireless (cellular) or Internet-based alternatives.